Among the best outdoor additions that any Missouri and Kansas property owner can have are patios. These amenities provide many great benefits that you will surely appreciate and enjoy. And when it comes to creating them, we at Outdoor Escapes are the best contractors that you can find in the state. Whether you’re from Blue Springs, Raymore, Grain Valley, or other nearby Missouri and Kansas areas, rest assured that we can reach you and build your dream patio. Aesthetic boost. Patios, when designed and built by professionals like us, can easily make any residential property stand out. Because they’re available in different themes, it’s easy to achieve your desired results. The various materials also ensure that we can pick the best ones that will make heads turn. Added functionalities. A patio is not solely intended to be a place for relaxation. It can actually serve other utilitarian purposes like venue for birthdays, weddings, and other social gatherings. Increased property market value. 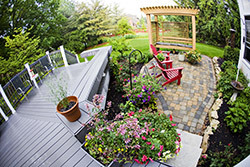 An outdoor amenity like a patio can dramatically increase any property’s market value. So whether or not you intend to have your property up for sale, consider having a patio as an excellent and wise investment. Rest and recreation. 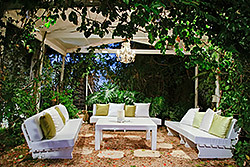 Any patio can be outfitted with different amenities like sofa set, a swing or hammock, and even an entertainment set. All of these will ensure that you’ll feel totally relaxed and rejuvenated after a hard day’s work. What Makes Us the Best Builders of Patios? Our company believes that it’s a crime to make unsubstantiated claims. Accordingly, we always strive to back-up our claims with the quality of our work. For one, we create patios that blend well with your existing structures –be it with your home or the landscape elements that you have like softscapes, hardscapes, and waterscapes. We also believe in giving our clients excellent patio options, like attached or detached type. We present them with design choices to make things easier. From the amenities to include, the theme, and the materials to use – our clients always have free reign. We can also create patios that will reflect your personality and provide your desired benefits, like if you want to use it for relaxation or to accommodate a large group. Only when it is going to affect the structural integrity or the beauty of the patio do we make certain compromises with them. But as much as possible, we try to stay faithful to their preferences to make their personality and design taste show in the patios that we build for them. 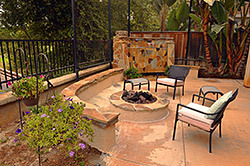 Additionally, we only use premium materials from partner suppliers like Belgard for patio pavers. From the flooring to roof, we ensure that only the finest will go into clients’ patios – like properly treated wood and premium roofing materials. This guarantees that your patio will last for decades without needing to be repaired too often. So if you want exceptional patios for your Missouri and Kansas property, please contact us at 816-529-5991 or drop by our office at Blue Springs. We look forward to build the outdoor amenity of your dreams.